A lifelong commitment to excellence. The drive of an Olympic champion. The sharp eye of an artist and the heart of a true philanthropist. It's hard to imagine a more fitting figure for the founder of a company dedicated to supporting the active lives of women today. While some call Kristi Yamaguchi an American icon, her most important fans just call her mom. After years on the ice, now Kristi balances her career with being a mother of two little girls, supportive wife, and advocate for children's groups. She knows from her own experiences that women on a mission to make a difference don't get a "day off." Managing the double-shift of real-life and motherhood inspired Kristi to build a brand that truly empowers a lifestyle for women. 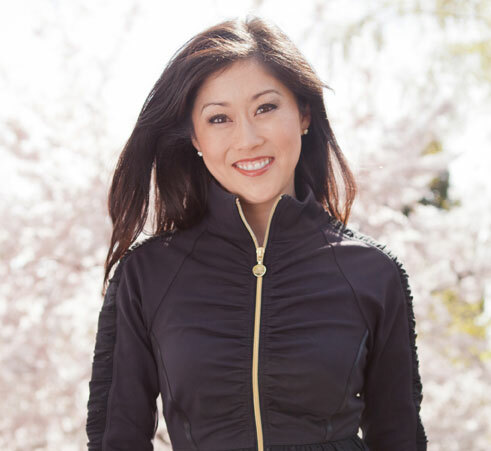 She launched Tsu.ya by Kristi Yamaguchi to do just that – with distinctive quality, tailored to real-life demands. A connoisseur of quality, Kristi's aesthetic is influenced by her years as an international athlete where she was captivated by the most premium looks of the world, from romantic Parisian to bold Hollywood fashion, and the nature-inspired art of Asia. The result is clean lines, on-trend colors, and stunning style. Modern designs with function, plus ultra comfortable fabrics – Tsu.ya delivers exactly what you need to feel confident and empowered. You can feel good knowing that a portion of Tsu.ya sales supports children's education and inspiration through Kristi's Always Dream Foundation. The woman of today is fearless, confident, and beautiful, while living in a hectic and demanding world. Tsu.ya by Kristi Yamaguchi delivers fashionable, modern, and functional lines to enhance and meet the demands of her daily activities with style and grace. From giving back to the community to inspiring daily confidence, Tsu.ya is committed to helping women feel good both inside and out. Copyright © 2012 TSU.YA. All rights reserved.